Reaction to the news that Sony's last ever MiniDisc players will go on sale in March is typically: "Eh? MiniDisc? Didn't that die out around 2002?" Despite Sony's firm belief that MiniDisc - a format offering the quality of a CD with the recordable functionality of a casette - would be the Next Big Thing™, it was unceremoniously destroyed by the arrival of mp3 and the popularity of a certain gadget from Cupertino. The Japanese company launched the MiniDisc in 1992. For younger readers, that was the year of the Maastrict treaty, Windows 3.1 and Lethal Weapon 3. For older readers, it's when Miley Cyrus was born. Unfortunately the new gadget started poorly thanks to Sony's penchant for overpricing new tech. Retailing at around the £400-£500 mark, only 50,000 were sold in the first year. Sony wasn't the only company making MiniDisc players - the likes of Sharp, Panasonic and JVC also had a crack. The idea behind it was that by using ATRAC (Adaptive Transform Acoustic Coding) compression, the format would have the running time and quality of a CD but be smaller and more portable than a regular cassette. 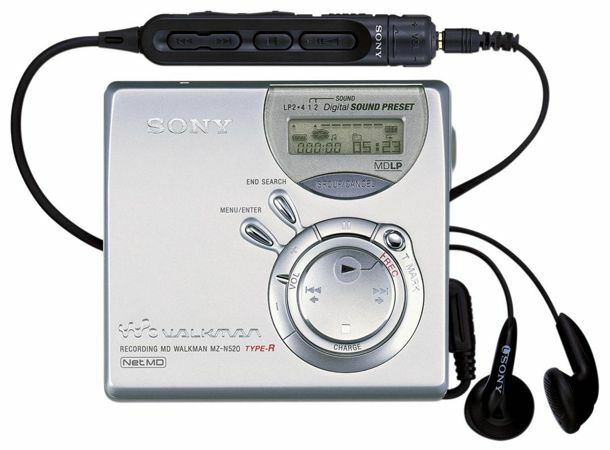 You could also re-record a disc without losing any audio quality - a pretty sweet deal in the time before CD-R and CD-RW. A bit of a problem (besides the cost) was that recording and tagging tracks was fiddly, and there weren't many pre-recorded MiniDiscs to buy because none of the record labels gave a damn. As ever, timing was also crucial. During the late-90's Sony tried a shot-in-the-arm with a $70m ad campaign, assuming that CD-Rs (which had arrived by then) wouldn't be affordable for another decade. But then, mp3 came along in 2001 as a bona fide alternative in the form of the iPod (now in its 5th iteration) and CD-Rs became dirt cheap. We'd already been enjoying mp3s on our PCs (thanks Napster!) and on players like the Diamond Rio PMP300 - but Apple's little white box took it to the mainstream and, to all intents and purposes, sounded the death knell for Sony's format. It took until September 2011 for Sony to finally announce it was ceasing production of the format. While the last players will ship to retailers in March, Sony hasn't turned its back on proprietary formats. The PSP UMD bore a striking similarity to a MiniDisc and even the PS Vita uses a proprietary memory card rather than the standard MicroSD. But in a very "Circle of Life" way, Sony has today announced a media event that could finally give us our first glimpse of the mythical PlayStation 4.